I am an amateur 3d-CG modeler. My long time dream is creating a model in my computer, and "printing" it into a real model. I knew about the process called "Stereo Lithography" (STL) for a long time. 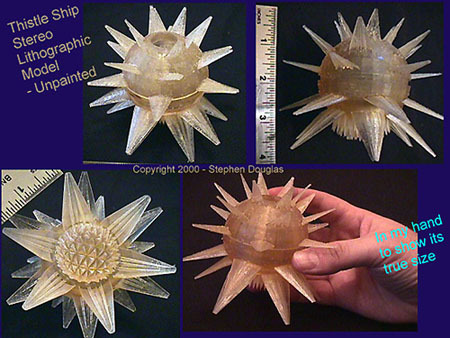 It is the process of taking a computer model and "Printing" it in laser setting resin plastic. However, most companies that do this charge quite a lot of money. They don't really like talking to hobbyists much either. I found a company in the US that will turn CG models into real, hard resin kits: www.ToyBuilders.com. They have a good explanation of the processes they use, and the services that they provide. The company does a lot more besides model "printing". You can even have yourself turned into an action figure! 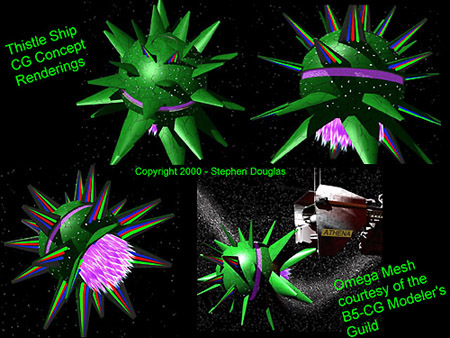 Omega mesh courtesy of the B-5 Modeler's Guild. I quickly found a CG-model that I wanted to turn into a resin kit. I chose a kit that I created during the first run of Babylon 5. This is supposed to be a techno-organic starship, very much in the style of the "First Ones." I had some discussions with the engineering staff at ToyBuilders. Four weeks later, I was the proud owner of a customized resin model. Here is the model just a moment after I pulled it out of the packing material. You can't see on these pictures, but there are details on the surface that are under 0.5 millimeters square, all perfectly reproduced. The model has a few internal bubbles, but no surface pits. The lines that you see in the pictures were created as the lasers hardened each layer of the resin. These have been easy to sand smooth with fine-grained sandpaper. The resin itself is slightly more pliable than standard kit-resin. I caused some minor design defects because I had an imperfect CG model. I have started to paint the model. So far, the Floquil undercoat has gone on smoothly and evenly. As soon as the paint job is finished, I will submit the model to the Gallery. I will include notes on how the painting and detailing progressed. I will try to compare it with other models I have done in the past. You don't need a CG model to talk to ToyBuilders. They can work with your drawings and ideas. If you do have file, you must be VRML or STL format. Nothing else will work. Period. You should count on the process taking at least 4-6 weeks from start to finish. You will be talking to them by phone and e-mail through out the process. The model will be more expensive than a standard resin-type kit, however it will be exactly detailed and customized to your designs. STL models have no flash, and almost no surface defects. Most of your time will be spent sanding down the STL lines on the surface. They are a brand new company, so be patient with them. I am not an employee of ToyBuilders.com, nor are they compensating me in any way for this article. But why buy my model when you can make your own? This page copyright © 2001 Starship Modeler. Last updated on 13 February 2001.